This temporary building is part of the provisional urbanisation of Glories’ Square in Barcelona. The program includes an information point, an exhibition area (showcasing the proposed project for the square), and a place to rent electric bicycles. The pavilion is located over two pedestrian crossroads; one crossing in a sea/ mountain axis and the other transversely connecting the nearby nursery oaks and the new pergola. 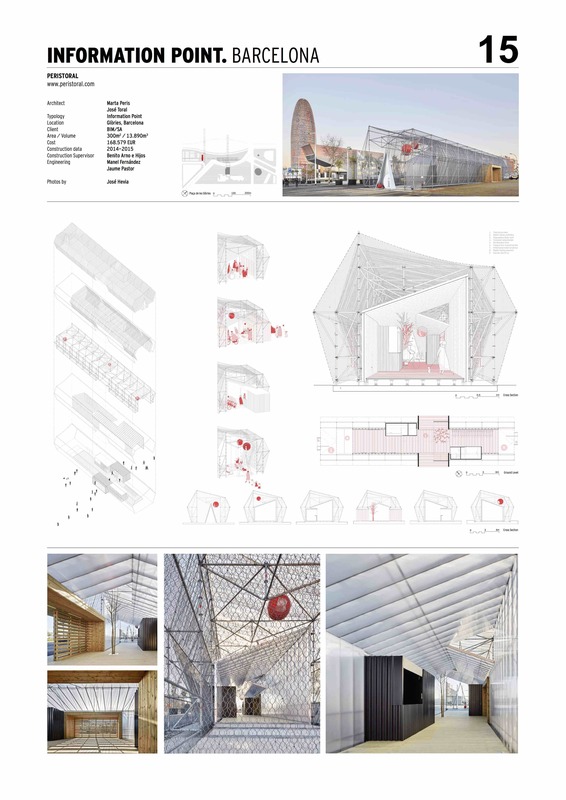 The provisional building’s ephemeral condition is detachable and reusable. This, determined not only by the choice of the structural system, a scaffolding construction, which has the aim of reducing the overall mark of the building left on the site; but also the building’s materiality, relating to the site’s context that is currently under-construction. This structure holds three skins: an impermeable and translucent poly carbonate skin, a shade mesh filtering sun radiation and a wire mesh surrounding the building for protection. During the day, depending on the sun’s location, transparencies, shadows and reflections can be viewed both internally and externally, giving a constantly changing perception of the building. At night, by placing artificial-lighting at a ground level, in between the polycarbonate skin and the shading mesh, the interstitial space is illuminated in a way that the source remains unseen. Both materials act as light diffusers, illuminating the internal space. From the exterior, the overlaying of skins creates a light atmosphere blurring the building’s limits.